Award-winning luxury ice cream from Yummy Yorkshire. The Marigold Café serves award-winning luxury ice cream from our favourite local producer, Yummy Yorkshire of Denby Dale. It’s lip-smackingly good stuff and there’s a wide variety of flavours to choose from: Yorkshire classics, seasonal and unusual flavours. We typically have up to 12 flavours for you to try such as ‘lemon, mascarpone and ginger’, ‘salted caramel’ and ‘white chocolate cherry’ (subject to availability) . 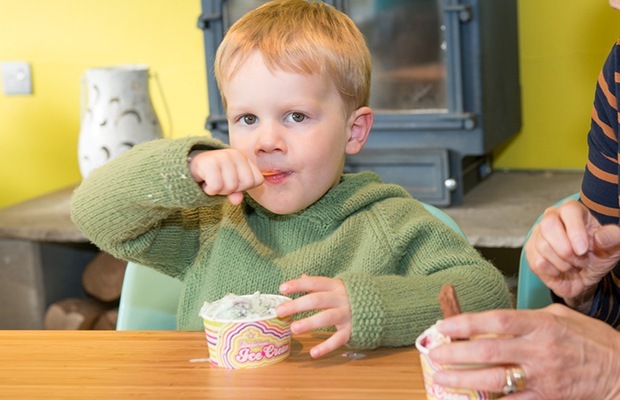 Delicious ice cream in a beautiful setting; what better way to spend a sunny summer’s day, or on a cosy winter afternoon in the café !